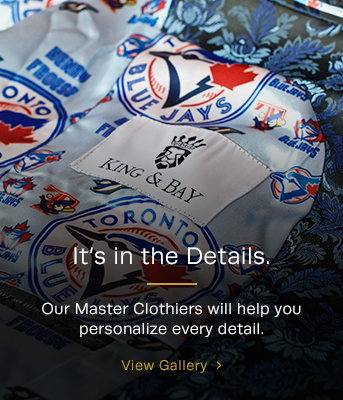 The special thing about 'specialty' at King & Bay, is that it's all about you and your unique personal style. Whatever you can imagine, we can create – simply bring us your vision and we'll get started. With our endless customization promise, we offer unlimited creativity for designing unique specialty garments, such as Chef's Jackets, Sherwani Jackets, or even professional jackets for specific occupational requirements, such as required by barristers for courtroom appearances. CLICK ON A LINK BELOW TO EXPLORE THE POSSIBILITIES. Customize your Sherwani jacket to fit any occasion, with stunning fabrics and signature details that will make you stand out. Presentation is as important on the plate as off. A signature custom jacket serves up the perfect look to stand out and make an impact. A custom approach to courtroom attire gives today's lawyer balance between traditional requirements and a perfect fit.